Wonderfully talented young gelding 2014 by Fürstenball/Jazzman with three exceptional gaits and a very elegant neckline. 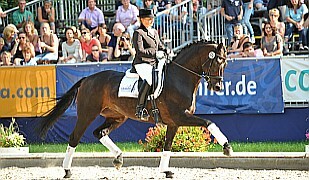 His movements and exterior make him an ideal candidate for highest level dressage. He has presence, charisma and the movements to back it up! 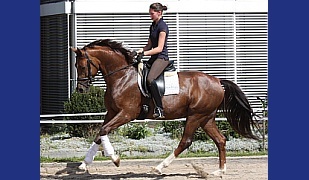 Young gelding with wonderful swinging and big movements and stunning pedigree for dressage ! He is currently castrated so in the moment unbroken and standing in the open stable in gelding group. Nevertheless, he is on the video still very in growing and the first time alone in a halle, he shows his very beautiful neckline and the talent for highest dressage through is swinging movements and relaxed kind. So is one of his brothers winner from the qualification for the german horse championship by the 6 years old dressage horse and now high placed in PSG. His brothers and sisters were all premium foals. 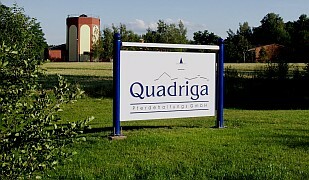 His sisters are all state premium/elite mares with nominations to the Oldenburger "Brilliantring" and are registered with the highest grades in the Oldenburger Main Stud Book. A brother qualified for the Oldenburger Licensing and Elite Auction. Another brother sold to Spain for a high price at the Elite Auction and scored high in the Spanish Stallion Championship. 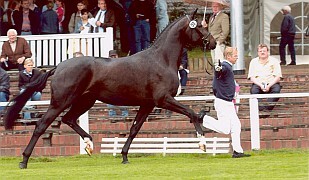 A sister was winner foal for the qualification to the German Foal Championship and also qualified for the Elite Auction. 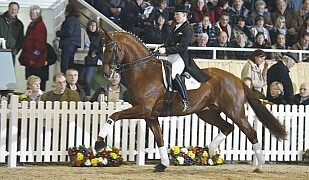 His dam is an elite mare and was by the elite mare show in Rastede. His granddam and great-granddam are also elite mares. 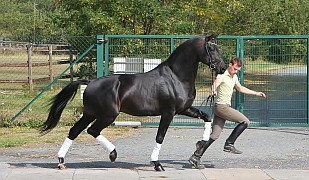 His granddam is the great mare Cosmopolitan, who is a stallion mother, winner of the championship in Oldenburg and placed high as a finalist in the German Horse Championship. She is the mother of licensed stallion, which just won a qualification for the German Horse Championship with the dream result of 9.0 and is now sucessful in Grand Prix! This young gelding has it all- tpye,movements and pedigree ! !